Queen Elizabeth II’s first visit to Nigeria in 1956. She is welcomed at the airport by federal dignitaries including the Minister for Labour and Welfare Festus Okotie-Eboh and Governor-General Sir James Robertson. A nice documentary profiling Nigeria’s journey from colonial era to independence. Lots of archive footage of independence conferences and the founding fathers like Azikiwe, Balewa and Shagari. This is a series of documentaries on Biafra. 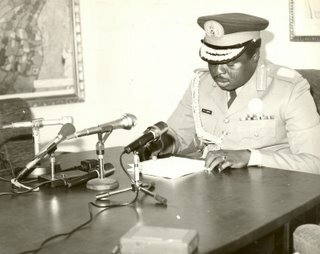 Produced by THE bbc, these videos feature footage of the battles and air raids, and interviews with the key players such as Gowon and Ojukwu, plus civilian and military participants and witnesses to the war such as Fredrick Forsyth. Nice video package about the overthrow of President Shagari in 1983 and Nigeria’s history of military rule. Sorry for the French commentary! Great documentary by Al Jazeera on African soldiers who fought in Burma against the Japanese in World War 2. Includes interviews with Nigerian soldiers of the campaign. I believe Brigadier Babafemi Ogundipe also fought in the Burma campaign. This is an excellent documentary regarding attempts by various Nigerian regimes to perpetuate themselves in power under the guise of “transition” programmes and constitutional amendments. This documentary regards the controversial 1985 trial and execution of Major-General Mamman Vatsa for allegedly trying to overthrow his boyhood friend and best man, Ibrahim Babangida. Another video with excerpts from the 1995 Special Military Tribunal “coup” trial of several prominent Nigerians including General Obasanjo, Maj-Gen Shehu Musa Yar’Adua and Christine Anyanwu for allegedly plotting to overthrow the regime of General Sani Abacha. Very easy to forget what a precipice Nigeria was on a little over 10 years ago. Do not take democracy for granted. These three videos are a run down of Nigeria’s leaders over the years starting from Abubakar Tafawa Balewa through to the current incumbent, President Yar’Adua. Also click the “Nigeria’s Leaders” and “Nigeria’s Great Speeches” pages on this site if you want to see more regarding these personalities. This is a nice selection of videos. The first is a series of old clips from famous Nigerians, including one of the Sardauna of Sokoto Ahmadu Bello who speaks in an impeccable old school British accent. Great work you have here. I commend you and your team for the indepths here. Really good job. Can you please provide another source for that video “A documentary on Nigeria”? The one up here (from Youtube) has no audio. You tube claims that its too sensitive, so its audio is wiped off. Can you post me another copy. I want to say I’m profoundly grateful for these immense catalogue of useful information and for all the amount of work and sacrifices you must have incured. I’m a Bini man, I must say until today, I’ve been living in a cochoo land as regards the the actual amount of sufferings the Igbos went through during the Nigeria civil war. Keep up the good work, and be rest assured – the true ‘NATIONS’ of Southern Nigeria as in the ‘WILL and PURPOSE of GOD’ shall rise again. I am overwhelmed with this collection of videos on Nigeria’s History. This has been a subject of great interest to me, but having access to explicit vidoes or documentaries with revealing details is very hard. What you have here would have been perfect for me, except that it is also very difficult to view uninterrupted video stream in Nigeria. I would very much appreciate it if you could send me downloadable versions of your entire collection on Nigeria’s History. Guys, thanks for your kind comments and platitudes. It is nice to know that the excruciating hard work that goes into this site is appreciated. Sadly I do not have downloadable links to these videos. I am not their copyright owner so cannot give you direct access to their downloads. the story of biafra is a story about my life. it is one of the shocking story my father use to tell us normally in the night then. all i can say is that the battle was not a vain one even though it was a battle for the extermination of the igbos which is equivalen to the haulocuast in germany as carried out by adulf hitler. my fellow biafrans the cry of our children and parents perished in the war was heard by almighty God and God will still answer us yet. Dear Mr. Max Siollun, how well could you be appreciated for compiling and making a whole library of Nigerian history available to this generation who incidentally and unfortunately are no longer tutored in Social Studies, History & Civics that could have informed them about their country. Thanks also to technology that has provided a green turf for sharing and learning. Even me, at my age, I’ve discovered, refreshed and learnt more about our history. You are surely great! I hail u Mr. Max! Thanks for the kind words Luqman. A lot of work goes into producing and maintaining this site. Glad you appreciate it. Am a nigerian,and i want 2 knw much abt my country 4rm google. I cant thank you enough for your hardwork in bringing together Nigeria’s history, especially military history together in one place. Your Book oil, politics and Violence is the most important book on Nigeria’s Military history. I’m sure posterity will reward you for your hardwork. I hope there are plans for more books in the future. Wow! What a collection! Thanks for documenting Nigeria’s history and for keeping us all informed. I can imagine the kind of time that went into research for this… Well done! Max Siollun wonderful website, I cannot believe after your first book which was very interesting and had a balanced perspective that another book “Soldiers of Fortune” is out and I was not informed, I think you owe me a discount….LOL. On a serious note I will treat myself this coming christmas to a copy. Well done!!!!! LO. Thanks for your interest in the book Gerard. I will check in with you at Christmas o – to make sure you bought the book! ;-) I also expect a review from you afterwards. D video is very sad, but dis will teach dos who are shouting we want Biafra today.which means dis nation we don’t want separation,separation is not de solution in dis country thanks.